Today we’ll take a look at the last two easy opportunities to take zero days at places that offer meals and accommodations. Vermillion Valley Resort. VVR is the most hiker-friendly of the places to stop along the trail. Tuolumne Meadow is within the park and is run by the park service, through the Delaware North Company. Their first priority is following their own policies. Red’s Meadow caters more to car campers and fishermen, and Muir Trail Ranch gets the vast majority of its customers in large groups that come in via Florence Lake. All of them tolerate JMT hikers, and occasionally even go out of their way to be helpful. At VVR hikers are a significant part of the business model. Unfortunately, it is also located the furthest from the trail. If the ferry is running across Lake Edison, it’s about a mile-and-a-half each way between the John Muir Trail and the pick-up point. You’ll climb aboard the ferry and they’ll take you right to the resort. Once you get there you may experience a little sticker shock. Some folks lose track of what they are consuming, and then are a little surprised at the bottom line when they check out. The second reason that the prices are a little steeper than in your local strip mall is that VVR is a long way from civilization. Everything that comes into the resort has to travel miles and miles over roads of varying quality, not to mention over Kaiser Pass, at 9,175 feet. On top of that, the season is very short, and the recurring maintenance on a facility that is subject to Sierra Nevada winters, year after year, must be enormous. I think the prices are fair, but be forewarned. But should you stop there? If at this point in the hike you need a break, then I believe you should. Otherwise, as the least convenient of the options, it is the one I tend to skip. Muir Trail Ranch. MTR is about a mile off the trail, but chances are you are going to be stopping here anyway to pick up your resupply bucket. The accommodations are log cabins and tent cabins. The log cabins have toilets and wash basins, but no showers. The tent cabins have no plumbing at all. 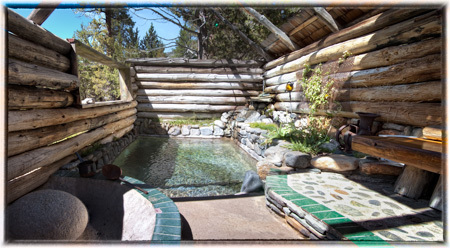 Before you start worrying about roughing it, though, you should know that all customers staying at the ranch are allowed to use the natural hot spring bath houses. There are two, and they are nothing less than opulent. I wish I had one just like it at home! This is trail living! The bath house at Muir Trail Ranch. Except for the bathhouse, my favorite part of the ranch is the log cabin lounge, full of books and comfy chairs. A few hours in there will do wonders for your recovery. Unfortunately, short stays at Muir Trail Ranch are sometimes tough to get. They usually know by mid-to-late January when they will have openings. My advice is to book early. I also suggest that this be where you take your last zero day. A full day off your feet, combined with two great night’s sleep, and you’ll be ready for the challenges ahead! Ahh VVR sticker shock. I have stayed at VVR since way back when, during Butch and Peggy’s proprietorship. I blame it on the first (free) beer. Still it is a great place for the zero day (which you will pay for if you overnight in the tent, the first night is free, the second is not) You can also do laundry there – but it is best to aggregate the load with other hikers. Old timers story- Peggy used to start making the pies at 0400 (propane oven doesn’t need the generator) and of course the hikers would wake smelling them baking. She called it the complimentary wake-up call. Two things about VVR you neglect to mention – First is the campfire. Usually you don’t see many of your fellow hikers at night. Because everyone has a different pace, (I roll 15-20 miles a day), you may meet people at Tuolumne or Reds Meadow but never see them again. VVR is the catch point, a log jam, where you meet others out there. As such you get to hear the stories and what not. BTW – This is when the bill goes up because beer and chips cost money. I learned the word “touron” there. A hiker doing the JMT S>N arrived at Happy Isles to see a touron feeding a bear. LOL. The other one is the Hiker’s Barrel. That’s where the food (and occasional extraneous gear) that hikers no longer want goes. The one thing that doesn’t cost you anything is quite a benefit. I always raid it for oatmeal or breakfast foods. I also have found some nice first aid items. I’m under the impression the same exists at MTR, however, I have never stayed there. Of course the raison d’etre for both places is the need for resupply. VVR doesn’t require the bucket, which is in its favor. MTR is further up the trail, two days closer to the end, meaning you only need 7/8/9 days food. Thanks for the great comment! Upon reflection, I may have been a bit too hard on VVR. They really are some great people and the services they provide are first rate. If you are careful, you can get and out of there quite reasonably. Thanks, also, for noting the campfire and the hiker’s barrel.